The secret is out. Folding cots have transformed what was one of the most uncomfortable parts of camping into one of the best parts. 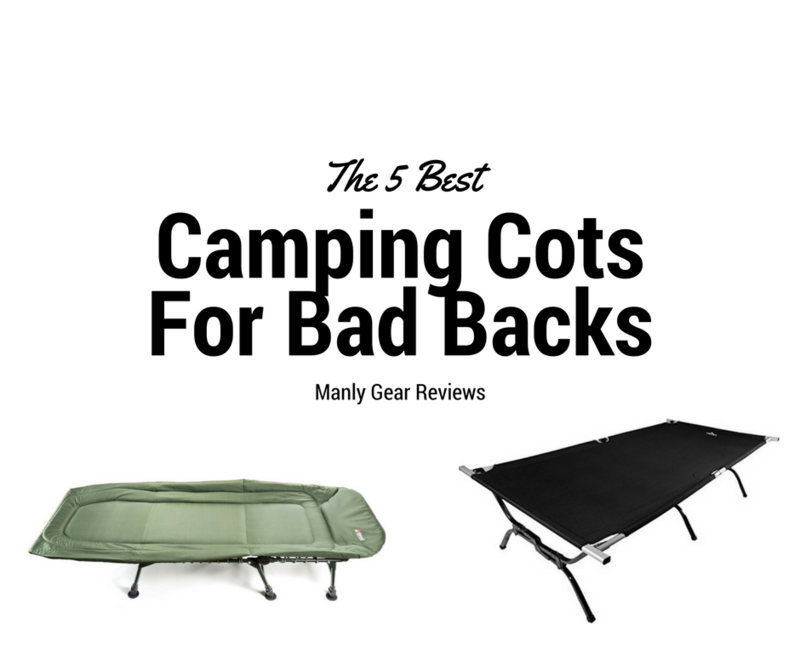 If you have a bad back read on as we have found what we believe to be the best camping cots for bad backs. See why the Teton Sports Outfitter XXL Cot won our Editor’s Choice for Best Camping Cot for a Bad Back as well as where the other excellent options fall in below. When I was young camping on the ground was great fun. I’d play hard during the day, and crash on the cool, hard earth at night. I’d be a bit stiff in the morning, but ready to get hop up and do it all over again. As I became older, and a bit more out of shape my experience with camping changed significantly. Sleeping on the ground was a death sentence for my back, and I’d be nursing it for the rest of the day while dreading another night on bumpy and uneven ground. Even air mattresses did little to ease my pain, and left me casting off camping as an activity for younger guys, or families with RVs. That’s the mindset that I kept for many years, until I stayed at my sons house and he had me sleep on his camping cot. I expected to wake up in the morning with terrible back pain, but that wasn’t the case at all. I was comfortable, and I just couldn’t believe that I was getting such good support from a camping accessory! I picked up the same model cot for my own personal use and I was back to enjoying camping like I never stopped. It’s been more than a decade since I started using cots and they’ve improved over that time remarkably. They’re lighter, more supportive and more affordable than they were a decade ago. I’m the proud owner of more than a dozen different cots, and I pick a new one up every few years when I see one that looks like it will be better than what I have. I’ve tested out a few dozen different options, and I routinely help other guys with back issues find a good sleeping option for their next camping trip. Hopefully this guide will help a few more people enjoy camping once again like I now do, without needing to go out and buy a massive RV. Support – When you have a bad back, support is the number one priority. You need something that’s going to hold you up off the ground, and support your back throughout the night. Comfort – After support comes comfort. You want to enjoy the sleep experience, which means it should be padded, or at the very least, create a nice flat surface that will accommodate an external pad that you can add on later. Sleeping Space – It’s tough sleeping on a cot that isn’t big enough for your body. Small cots also lead to uncomfortable sleeping positions which can cause back pain. Make sure you get one big enough for your body. Ease of Use – There’s nothing worse than spending the first 20 minutes of your camping trip assembling a stubborn cot. Don’t put yourself through that every time, get a quality cot that will fold out and fold back down again in less than a couple minutes. Compact Storage – When you’re done with the cot it shouldn’t take up too much space. 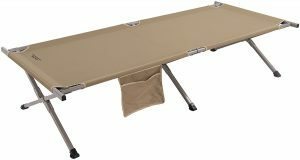 Cots that fold down compactly are easier to bring camping and to store in smaller vehicles. 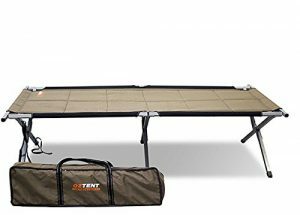 The Teton Sports Outfitter XXL cot is a good solid option for campers with bad backs. It’s nice and wide and offers an exceptional level of support. The canvas section is composed of 600D poly, and it can withstand up to 600 lbs. without issue. The cot is a bit more difficult to set up than some of the more lightweight models, but it’s rugged, rigid and provides support that you can’t find on the smaller models. It slips right into the included carry bag, and works well as long as you have a tend large enough to accommodate it. The ALPS Mountaineering camp cot is comfortable for back or side sleepers. It’s made from good quality materials that offer a reliable feel and durability for sleepers up to 325 lbs. The cot is simple to put together and to begin sleeping on. It takes just a few minutes to go up and it’s ready for use. It provides a surprisingly roomy sleeping experience. The cot also comes with a convenient storage bag that makes holding smaller objects up off the ground easy to do. It’s a bit shaky compared to some other cots, but that doesn’t take away from its durability or comfort. The Coleman ComfortSmart Deluxe cot comes with a nice sleeping mat that creates a pleasant surface to lay on even for those with a poor backs. It offers enough space to hold sleepers of up to 6’6” in height without discomfort. The cot itself holds up to 300 lbs. without issue. It’s not the most portable option out there though, and will take up more space in your trunk than other cots do. This is a slight con, but it will fit into most vehicles without issue. As long as you aren’t really tight on space it’s a pretty good product to go with, and other more compact cots would take up just as much space when you factor in the sleeping mat as well. For sleepers looking for flexibility and comfort, the Chinook Heavy Duty padded cot is a pretty good pick. It’s not the lightest of cots, and takes up quite a bit of space, but that’s partly because it comes with nice thick padding up on top to create a comfortable sleeping experience. This cot offers 80” of length and 33” of width, and comes up off the ground a comfortable 20”. There’s plenty of storage space underneath, and it offers room for a single person to lounge. Just make sure that you have a large tent. This cot is actually pretty light weight at around 22 lbs. and the head adjusts up and down, so it can function as a nice long lounge chair as well for reading or whatever else you want to do. 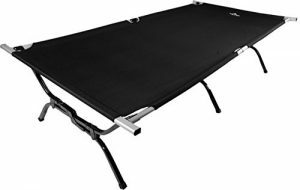 When you want a nice flat sleep surface to lounge on, it’s hard to beat the OzTent Gecko Camping Cot Stretcher. It’s really supportive and offers a nice padded surface. 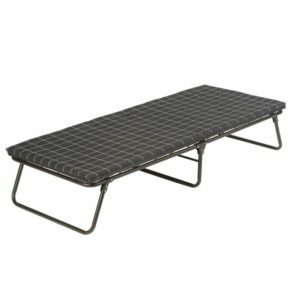 This is my favorite cot for cool weather camping because of the built-in insulation that protects against the cold. It will hold up to 330 lbs. and is designed to fold out quickly and easily. The cot packs down into a nice compact little bundle when you aren’t using it, and won’t take up too much space in your vehicle. It’s just 26 lbs. and is easy to move around or set up where it’s needed.